No need to register…just show up with pen and paper for taking notes, dressed for the weather as classes are outdoors, and bring a lawn chair if you want as we have limited chairs, but there is always grass to sit on . 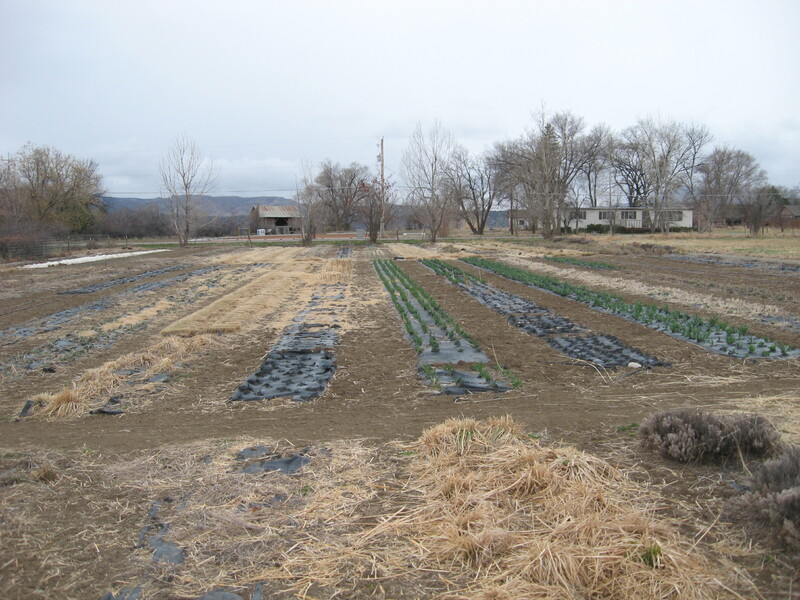 We’re located at 1270 Field Ave. in Canon City, CO. Visit desertcanyonfarm.wordpress.com for more information and directions. 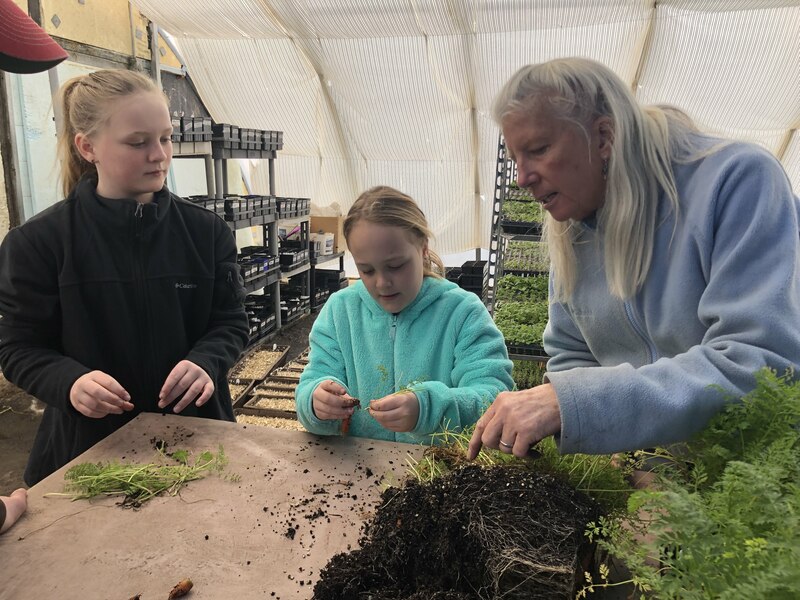 April 11, 2019 Open Farm Days & Our Free Workshops Start in Two Days! Meet this spring’s crew of the most amazing women you are likely to ever know! If you have been here during Open Farm Days, you will recognize Farm Stand Liz (going left to right) and Stephanie. 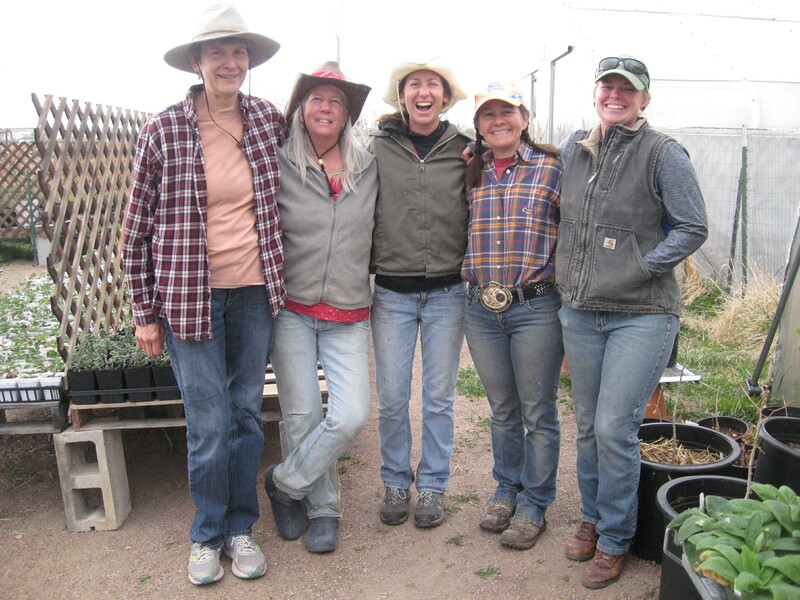 They are the women that keep the Farm Stand beautiful and running smoothly during our Open Farm Days. In the middle is Kaila, than Susan and Lizz. 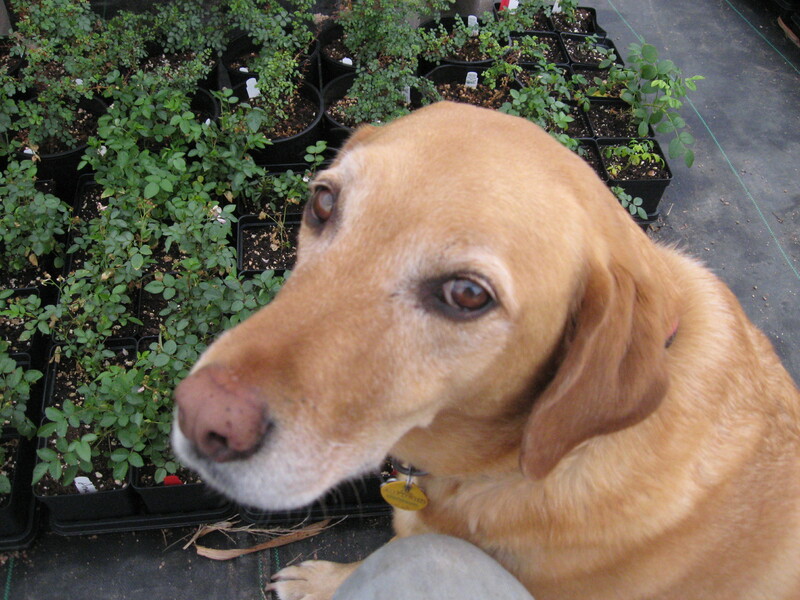 These gals work with us in the greenhouse and gardens. They are the seeders, transplanters, order processors. 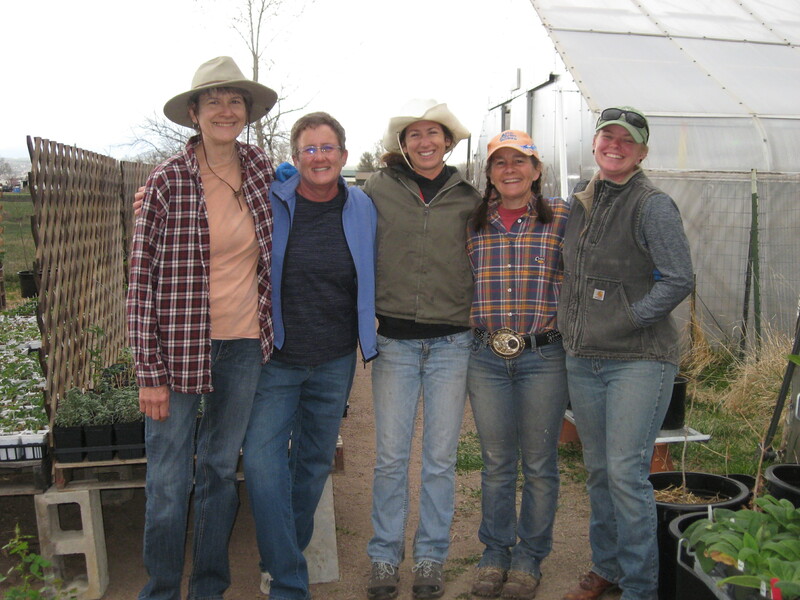 All five of these women are nothing short of incredible, helping with anything and everything that needs doing on this farm. They have been coming up with a theme for each day of the week and it has been great fun. We’ve had Muffin Monday, Tie Dye Tuesday and in these pictures…Western Wednesday. I can’t wait for you to meet all of them if you are visiting the farm during Open Farm Days. Kaila will also be helping out in the Farm Stand. Susan and Lizz are teaching workshops this year. In fact, on Sunday afternoon, Lizz will have a beekeeping workshop from 1:00-2:30pm. On Saturday, I will be teaching a workshop at 10am on Growing & Using Culinary Herbs and at 1pm, I’ll be giving some guidelines on how to Prepare Herbal Tinctures, vinegar & Honey. Join us if you can. No registration is needed, just show up with pen and paper to take notes, dressed for the weather, since we hold these workshops no matter what the weather is like. If it is really cold and snowy outdoors, we might find our way to the garage for class on Saturday, but expect to be outdoors normally under the workshop tent. 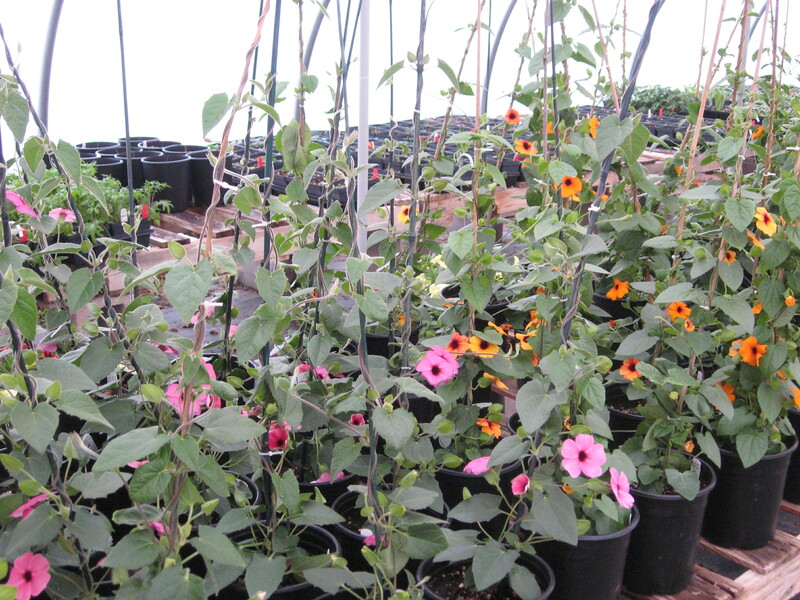 We have been stocking the Farm Stand with loads of plants of all kinds, all grown certified organic on site here at Desert Canyon Farm. This whole week, everyone has been making things tidy, getting all the plants labeled, putting up the plant information signs and all the other things that must be prepared for you, our visitors, when we open the gates to the farm to the public for our annual Spring Open Farm Days beginning this Saturday. Open Farm Days are April 13th thru June 9th. We’re open Saturday thru Thursday (closed on Fridays) from 9am to 4pm. Workshops are help on the weekends and are always free. So, I have more plant signs to laminate tonight, so I’m going to keep this post pretty short. Visit the Open Farm Days and Classes & Events pages of this website for all the specific details and directions to the farm. We’ll look forward to seeing you this spring! Shrek, Chris, Lizz and I have been at it all weekend, trying to make some sense of the Farm Stand by putting plants in their places and getting things ready! Shrek thought you might enjoy getting a sneak peek at some of the plants in the Farm Stand, along with some of the other work that has been going on this week. Most of the perennial herbs and other hardy plants have found their bench home in the Hygge Greenhouse and are ready now to be labeled. 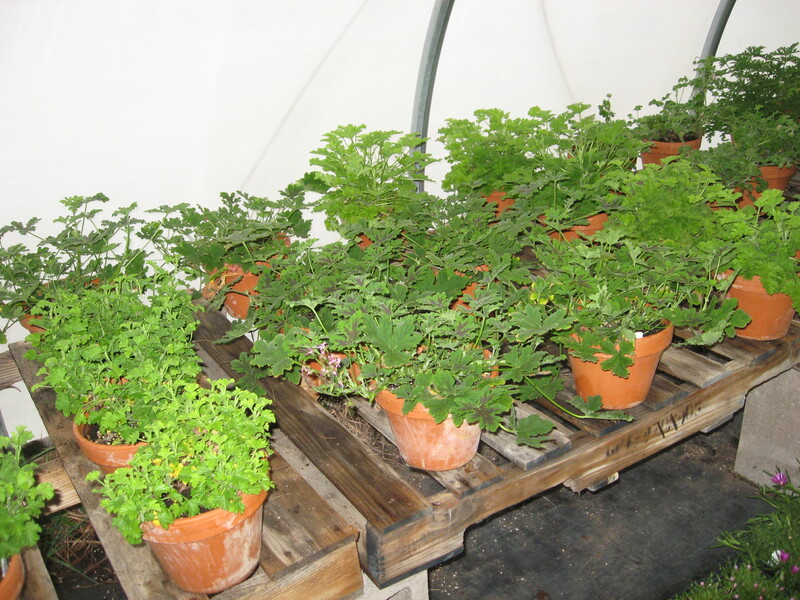 We will have 10 different kinds of Scented Geraniums this year. 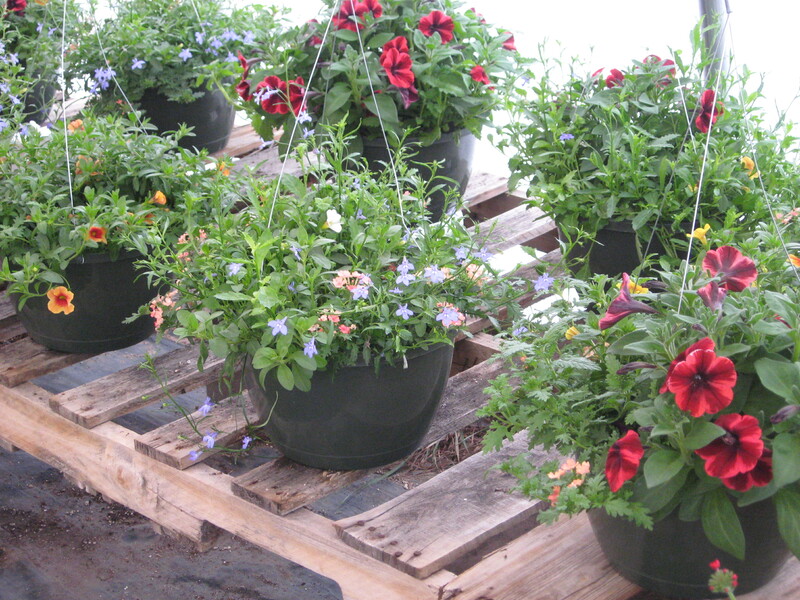 The hanging flower baskets continue to grow and get more beautiful with each passing day. There is a pretty awesome selection of tender succulents that will be perfect for succulent container gardens, houseplants or patio plants during the warm months of the year. 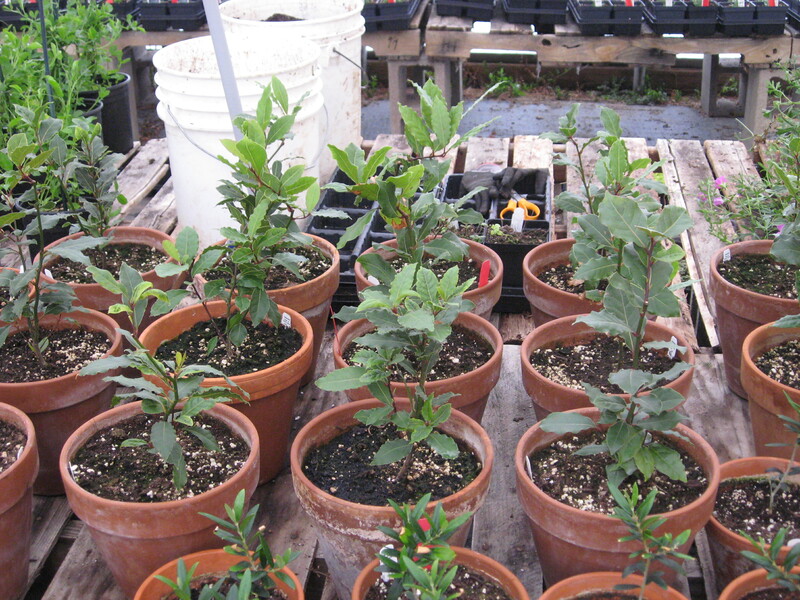 The bay laurel trees are looking great. 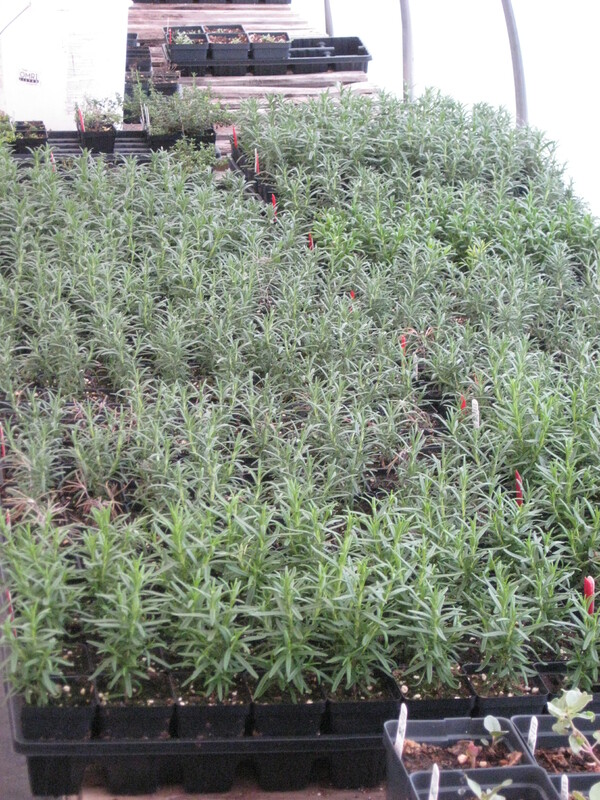 There are hundreds of varieties of herbs like these Rosemary’s. 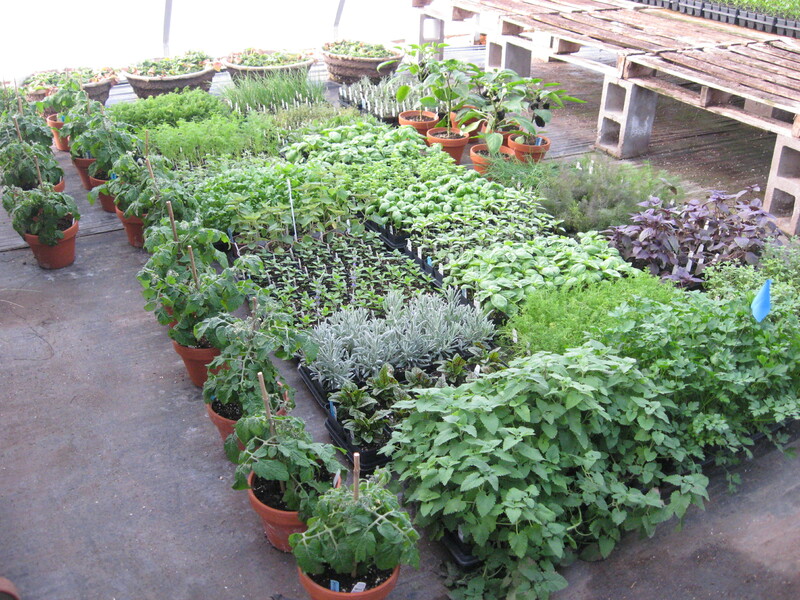 We will have culinary, tea, fragrance, medicinal, textile and personal care types of herbs for sale, so you are sure to find many different options for your herb garden. 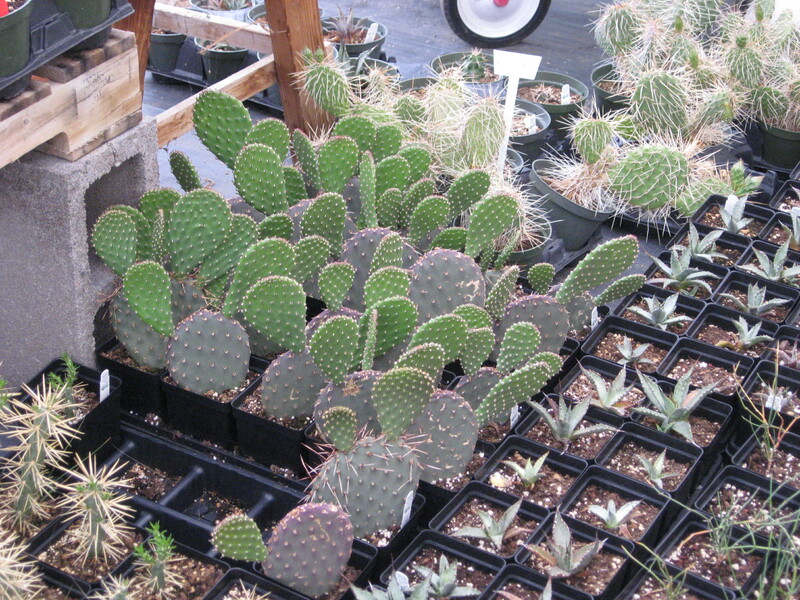 The hardy succulents and cacti will go out into the nursery area this week now that the night-time temperatures are going to be back in the 30’s. Pepper row includes so many varieties of sweet and hot peppers that it is mind-boggling. Once they are all labeled, I’ll have to count and see how many different kinds of peppers we will have available, but I know it is in the neighborhood of 40 varieties more or less. 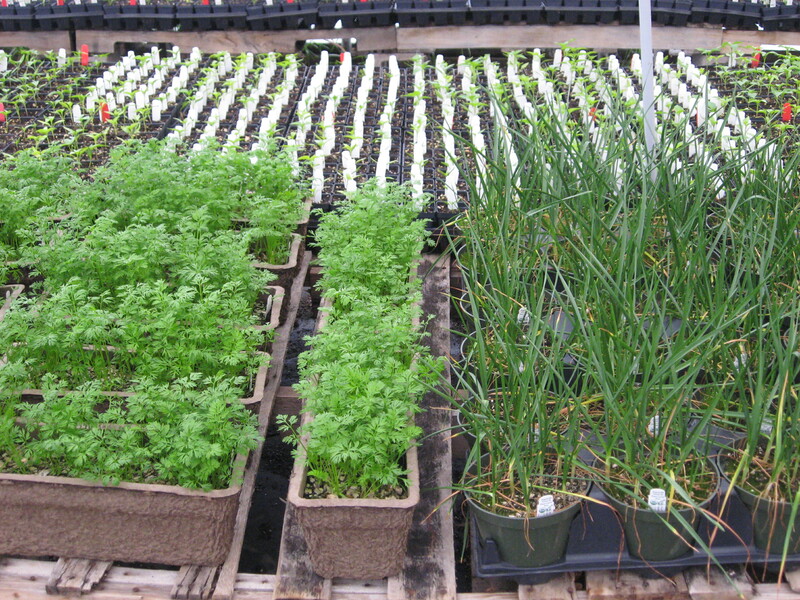 The carrot boxes and the garlic seedlings are in place and ready for your inspection on April 13th when we open. 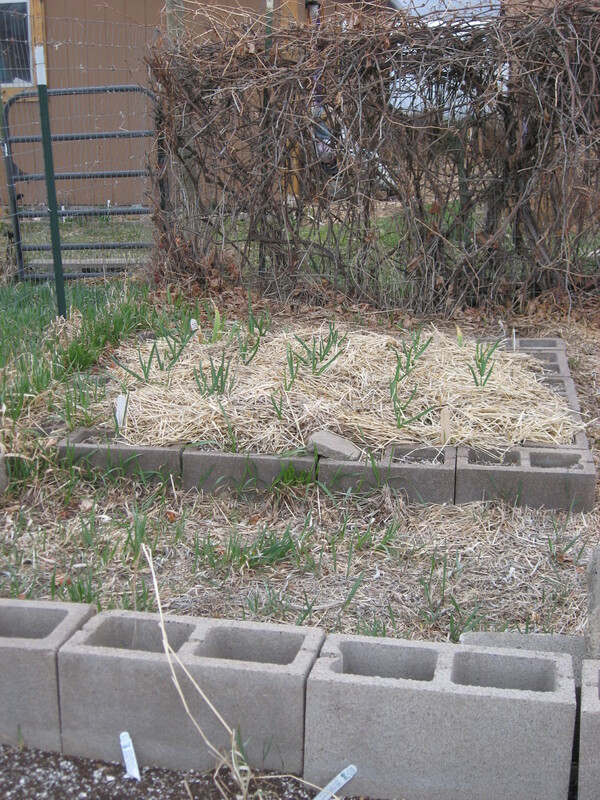 My own garlic bed in my food garden is also quite happily growing. Remember we said we would have a lot of hardy figs available this year? Well, we have loads of them, both Violet de Bordeaux and Chicago Hardy Figs. 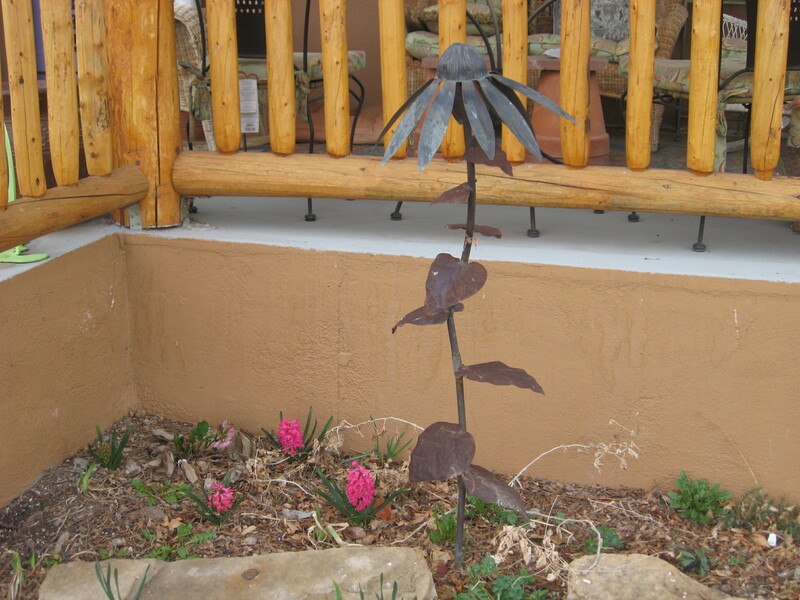 These will be hardy for most gardeners, although probably not mountain gardeners. My fig in the garden will be 5 years old this spring and it does really well. For mountain gardeners, we encourage you to grow them as a patio container plant in the summer and indoors the rest of the year. There just isn’t anything better tasting than a fresh fig. Last year we had only about 8 plants and they sold out in about 15 minutes, so this year we have grown a lot more plants. 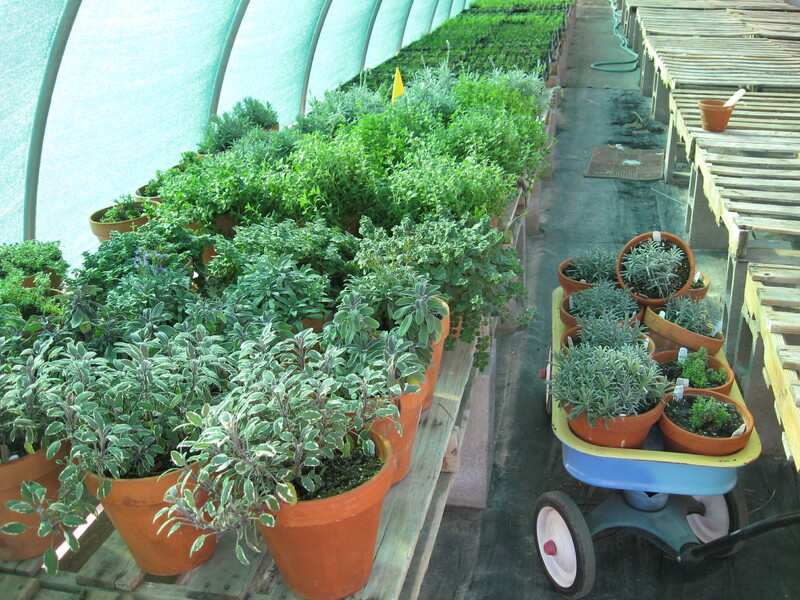 See all those plants on the floor…they go outside this week to the nursery area. They’ve been growing at night temps in the 30’s for weeks now, but I didn’t want to put them outdoors until this last cold spell passes so that they wouldn’t slow down their growth too much. 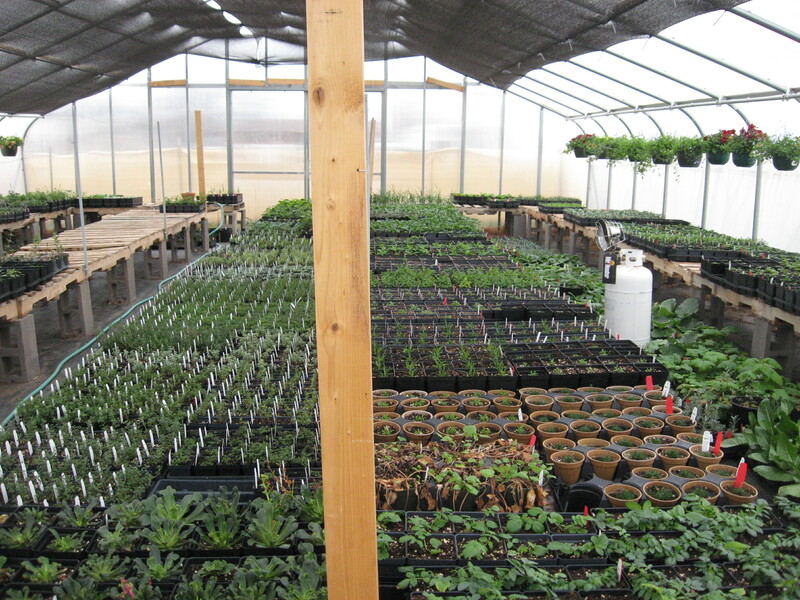 After tonight, night temps are supposed to be back in the 30’s, so all these plants will find their place in the outside nursery area of our Farm Stand. Chris has been getting it all ready for the plants. He’s got the benches in place. The lattice is up, where we will attach the plant information signs. 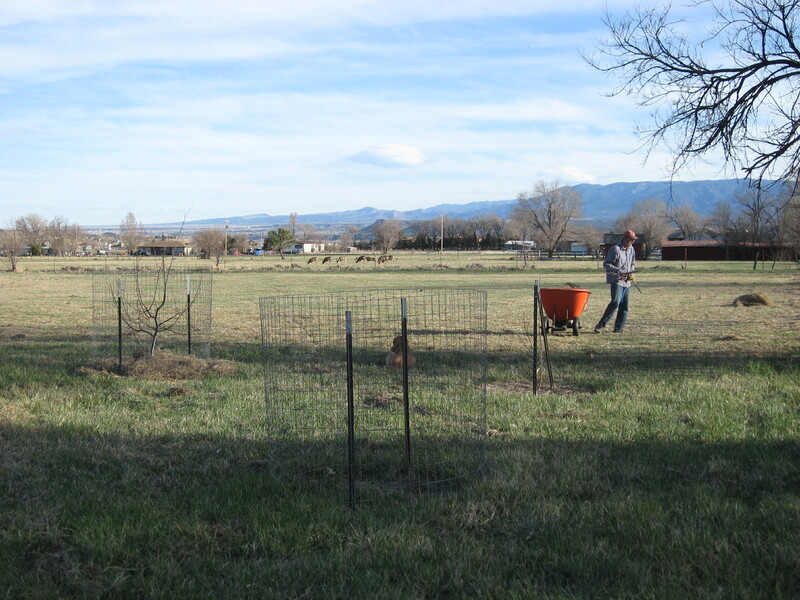 Lizz got the fruit trees in place and on it goes. 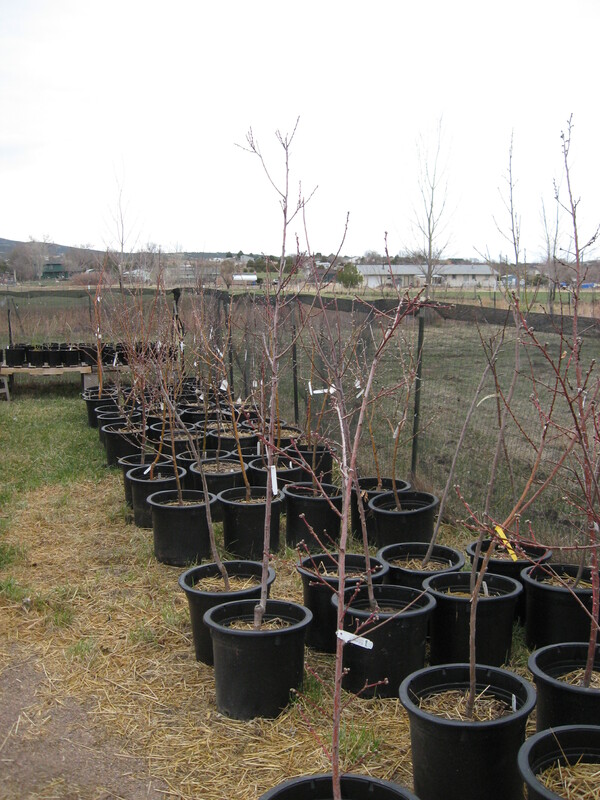 Our collection of heirloom varieties of fruit trees will include several kinds of apples and plums, a few peaches and some apricots. 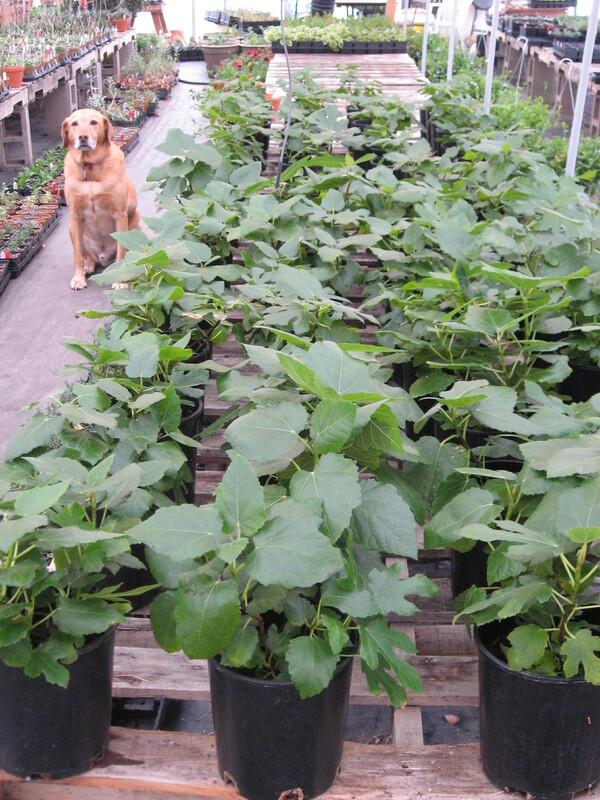 We also have mulberry trees, elderberries and loads of different kinds of berry bushes and strawberries. There are 5 kinds of hops, including several varieties favored by beer brewers. We also have seed grown species hops that herbalists often prefer for medicine-making. 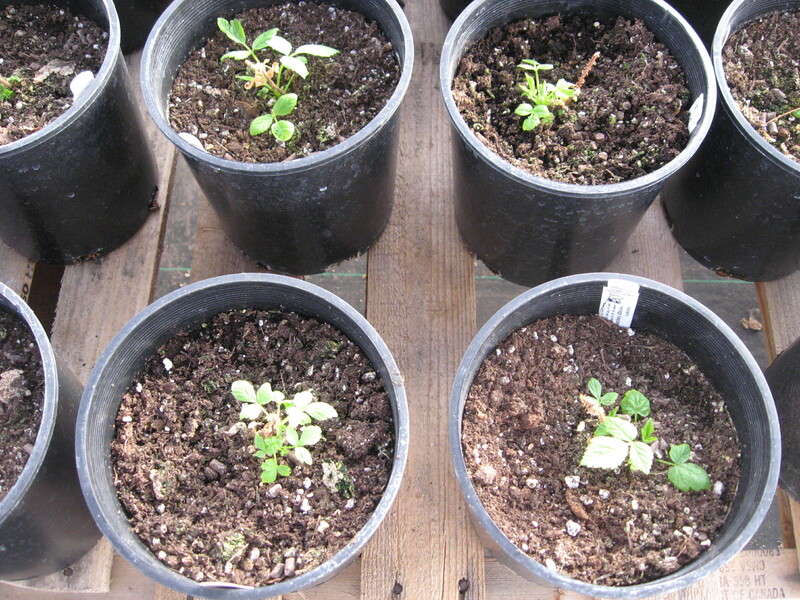 They have all been overwintered outdoors and are now beginning to sprout. By the time we open in two weeks, I think they will look very nice indeed. For those of you who like old-fashioned roses, we have many different kinds of them. 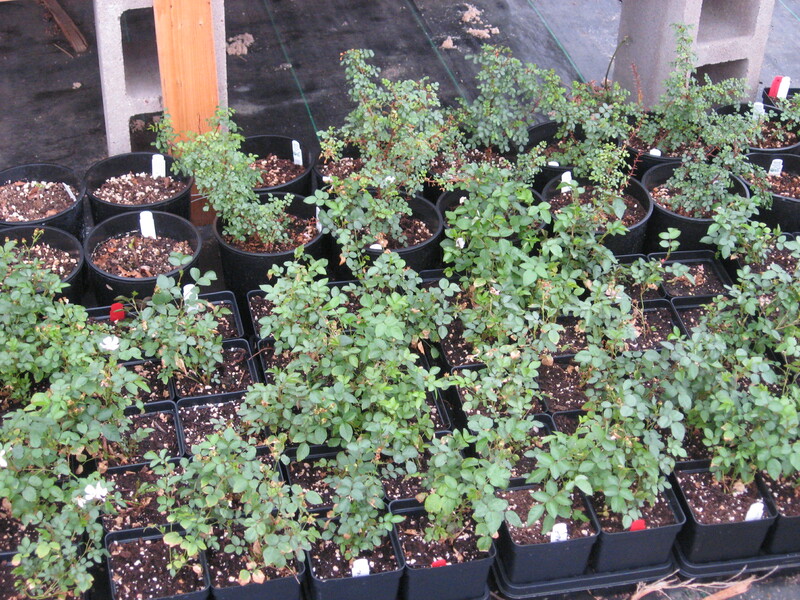 They range in sizes from 1 and 2 gallon pots to small plants in quart pots. Perfect for the gardener who loves these heritage and species varieties of roses for their gardens and hedgerows. Chris has been spending quite a bit of time making the flower seed crop field tidy. 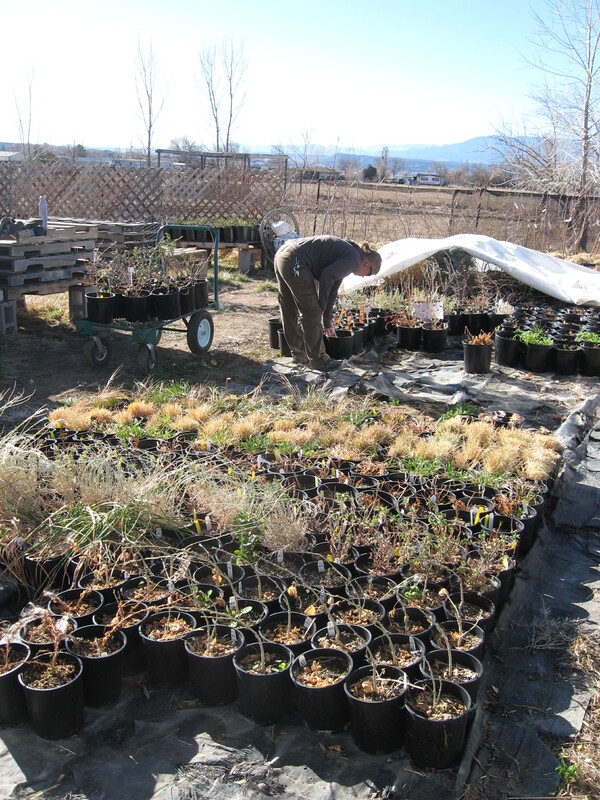 All the ornamental grasses are cut back and many of the other perennials are starting to poke out of the ground now. The green you see are two different types of alliums. One is called Tibetan Mountain Onion and the other is Fragrant Flowering Garlic. 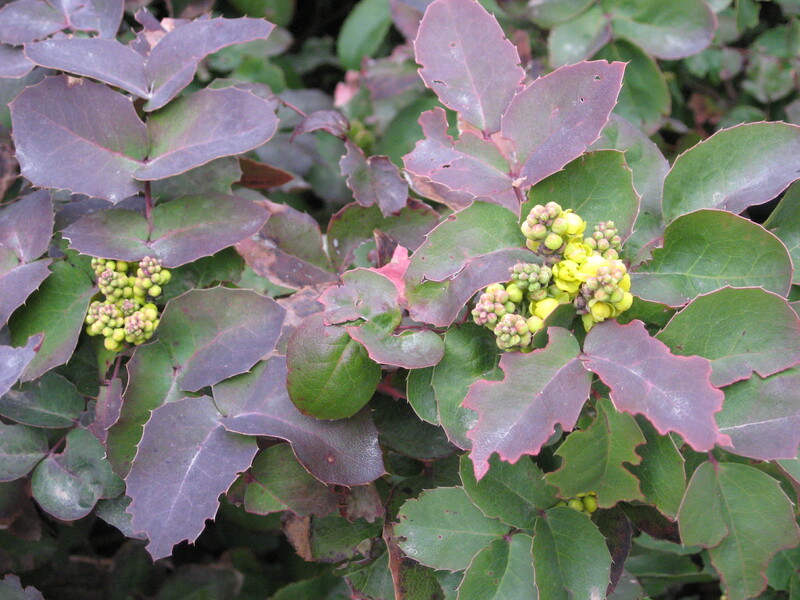 The Mahonia (Mahonia repens) is in full flower now and gorgeous! 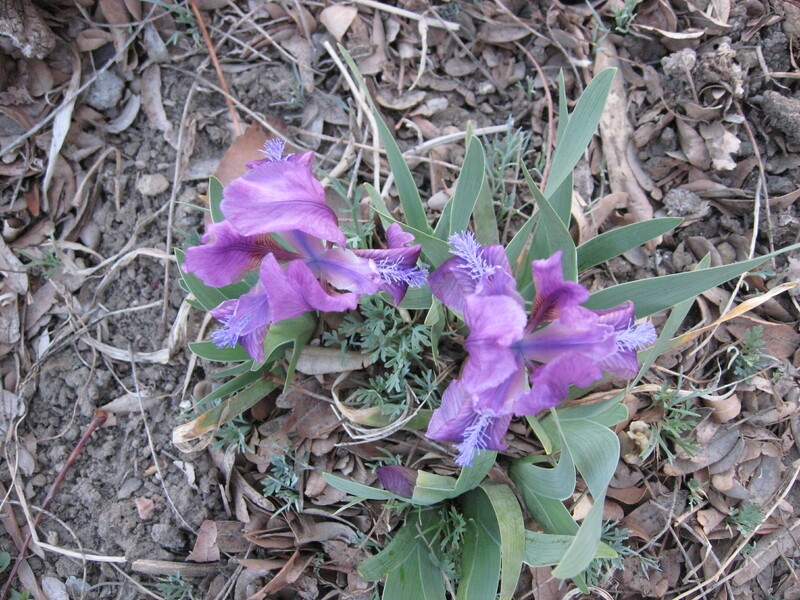 Bulbs are blooming everywhere in the gardens. These pink Hyacinths smell so wonderfully fragrant as we go in and out the back door. Oh, and did I mention that the Thumbergias are putting on quite a flower show in the Farm Stand these days! So, as Shrek and the rest of us work hard over the next 2 weeks to get everything in place and finished, and ready for our visitors during Open Farm Days, enjoy the first part of the spring season. It’s time to be outdoors enjoying all that nature has to greet you with! 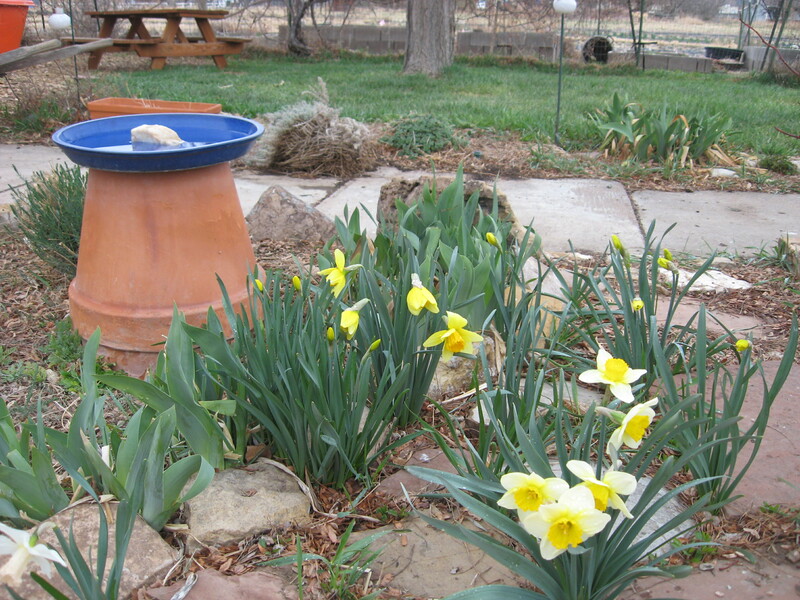 The dwarf iris bloomed today and proved that spring is officially here! The Mahonia has been budded up for a couple of weeks now, and it is finally thinking it is time for the flower buds to start to open. I bet by the end of the weekend, they will be bright yellow and fully open. 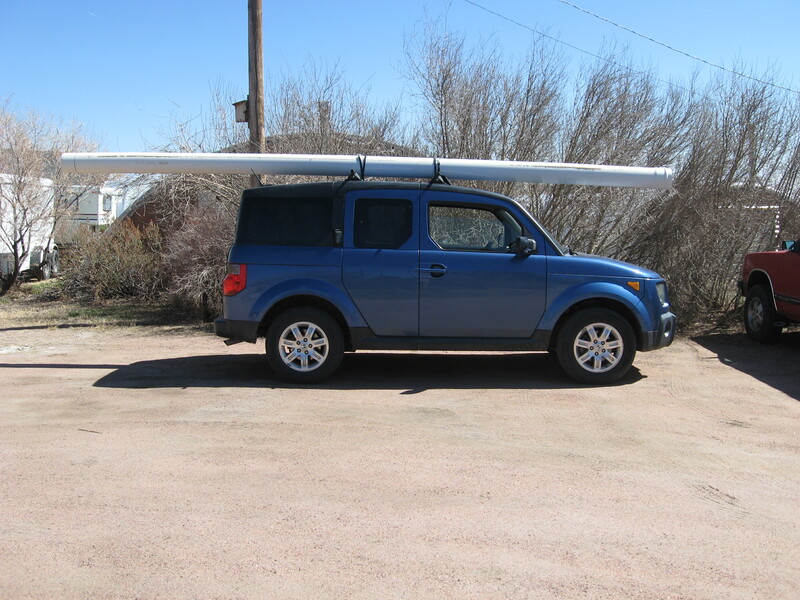 The Mad Hatter (aka: my name for our Honda Element) pipe express delivery from the lumber yard. Chris has been working on the irrigation system this week, in the hopes that irrigation water will soon be delivered to us. One of the pipes that carries water into our pond had cracked, so off he went to purchase a new “stick” of pipe. No need for a truck to bring it home, when you have the Mad Hatter Express at your service. 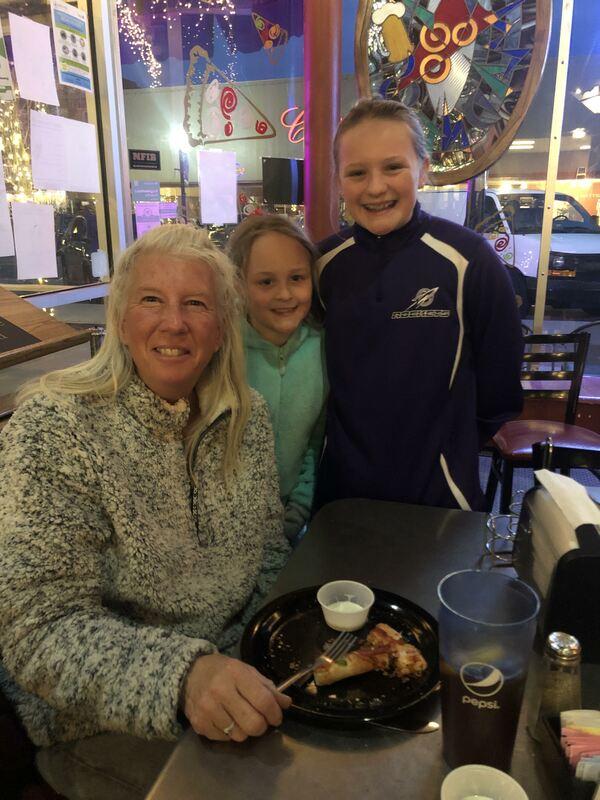 Last week we had very special company when our nephew, Andrew, and niece, Missy, and our two great nieces, Camryn and Emersyn, came for a visit. 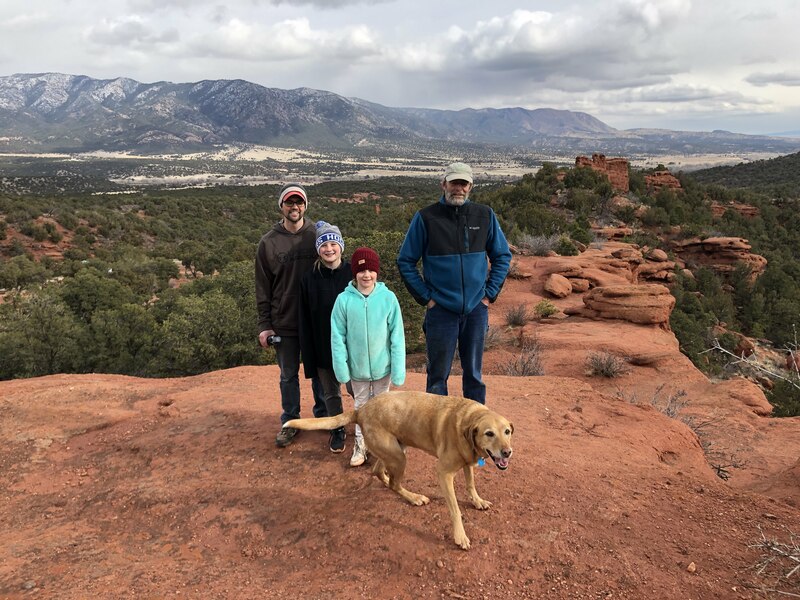 Of course, Chris and Shrek had to take them on a hike in Red Canyon Mountain Park near our farm. 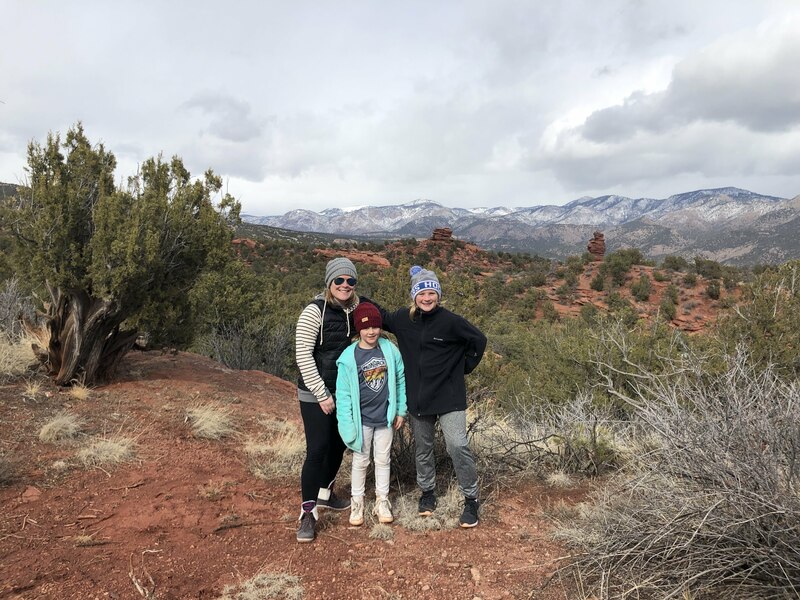 It’s hard to tell in this picture, but they climbed up to the top of a big red rock formation for this picture and they are standing high on top of the rocks way above the trees. It was a chilly day, but when your hiking and having fun, who notices the cold temperatures! 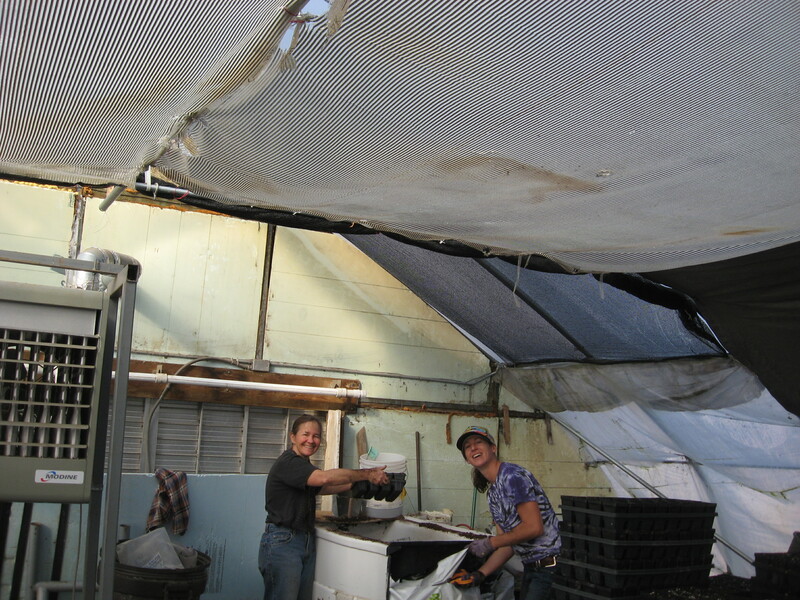 The girls helped out in the greenhouses, which was great! They harvested 4 planter boxes of baby carrots, which we all enjoyed snacking on. There is just about nothing sweeter than a freshly harvested baby carrot. Emersyn helped me label a lot of flats of peppers so that they are ready to go out on wholesale orders now. And of course we had pizza while they were here. 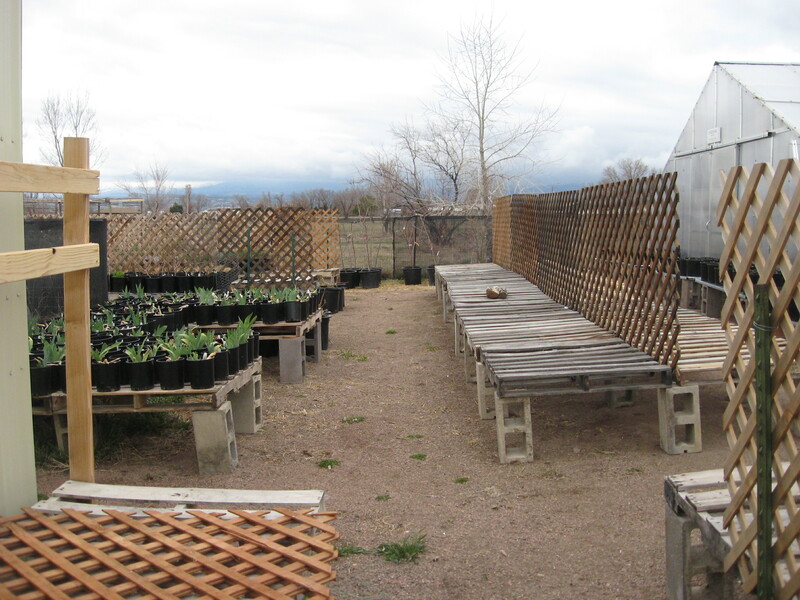 This week, we started the process of getting the Farm Stand and nursery ready for Open Farm Days. Lizz and I uncovered all the perennials and shrubs that have been wintered over outdoors underneath white frost blanket. The plants look great for still being half dormant. They are beginning to start to grow now with the longer days beginning to happen. 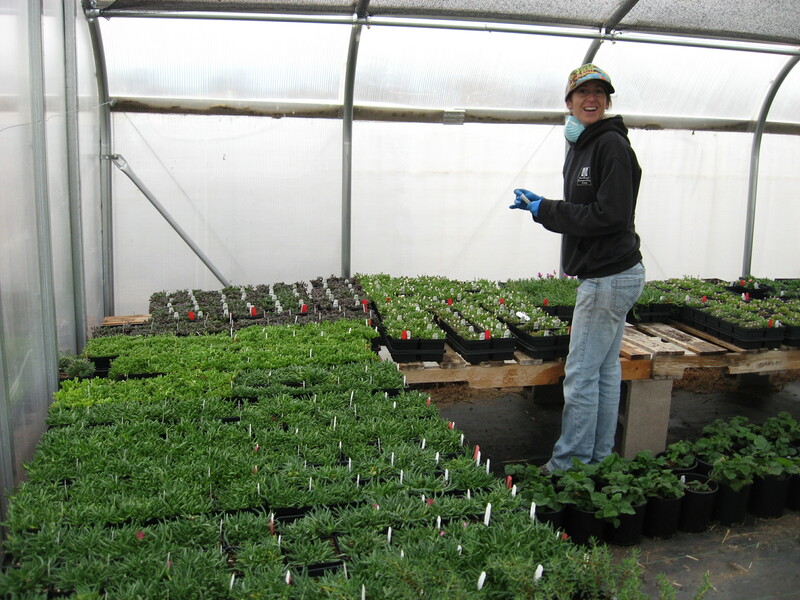 Kaila and Susan started the very big task of putting labels into all the individual pots. They were labeling iceplants on Thursday. 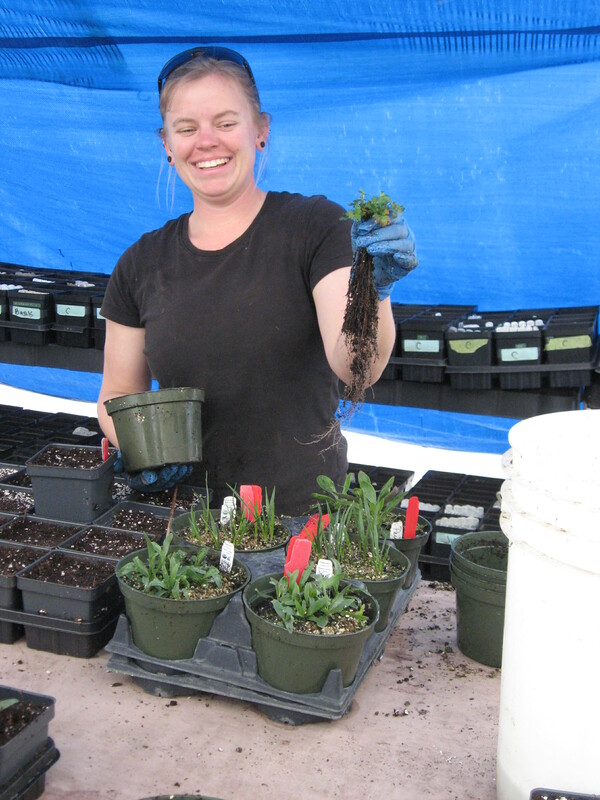 In April, our Farm Stand crew will come back to work, Liz and Stephanie, and they will be helping us get all the plants ready for opening day on Saturday, April 13th. Check out the Open Farm Days page of this blog for all the details. March 13, 2019 Baby Ducks, Wholesale Orders, Printing Plant Signs & Wind! It’s been a while since I’ve had a chance to write a post, and I apologize for not doing that in such a long time. Last week things were all in a dither, as wholesale orders started to kick into full swing for the spring season AND we had a booth at the Spencer’s Garden Show event. The garden show took 4 days, counting set-up on Thursday and 3 days for the actual show, and I it was a good event for all. 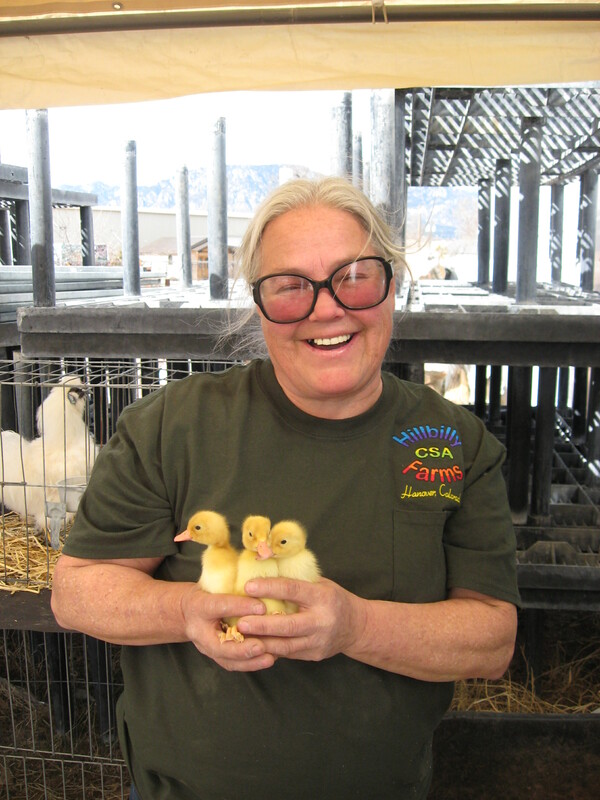 Below is a picture of Donna, the co-owner of Hillbilly CSA Farms, holding her 2-day old ducklings. They had the booth next to ours and it was so much fun to visit with all the animals they brought to the show, including chickens, ducks, baby goats and more. If you would like to know what they are up to on their farm, visit their website at http://www.hillbillyfarms.net . 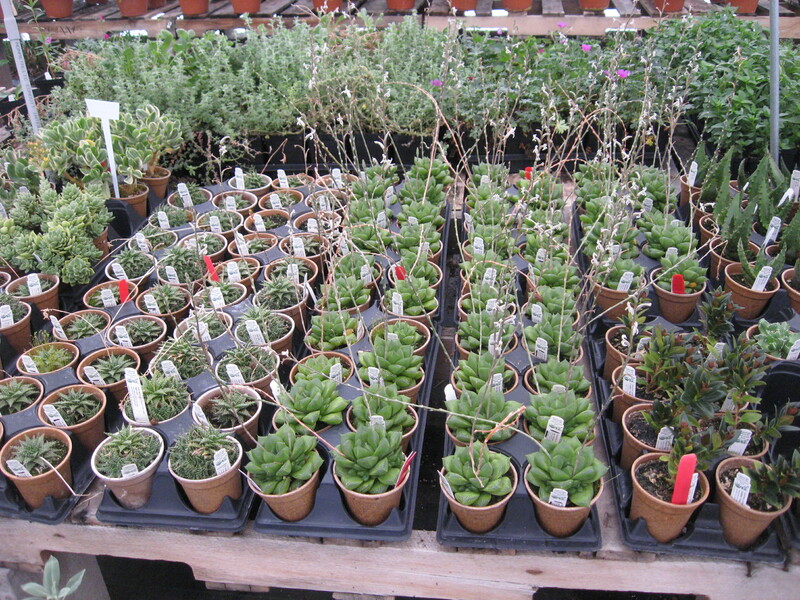 These are some of the plants that we sent out this week for one of our wholesale orders. It’s so nice to send lovely plants to our customers, knowing that their customers will be growing them either indoors on their counter tops or outdoors in their gardens. The women that work with us planted the main spring tomato crop today. 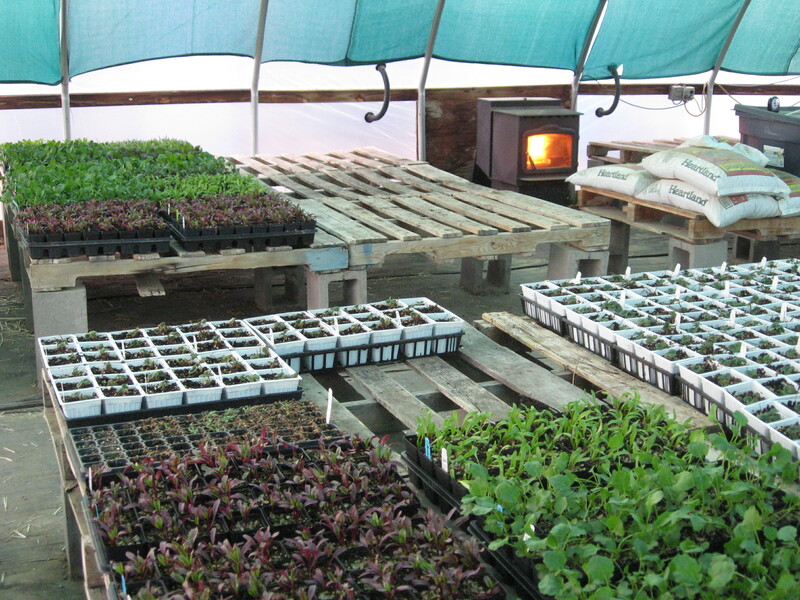 They also did some seeding for cool season veggies and salad boxes, annual flowers, basils, dill and epazote. They have been transplanting plugs into bigger size pots too and now they are working on cuttings of lavender, sages oregano and some other varieties. Busy times are here. We are also trying very hard to ignore the wind, which is blowing hard and cold here today, and making us all feel a little bit crazy. Working in greenhouses when the wind is blowing hard is nerve-wreaking. It is noisy outside and in the house, but in the greenhouses it sounds like a freight train is going thru and it leaves you wondering when the plastic skin(covering) of the greenhouse is going to blow and tear off the structure. We’re all hoping it settles down soon! 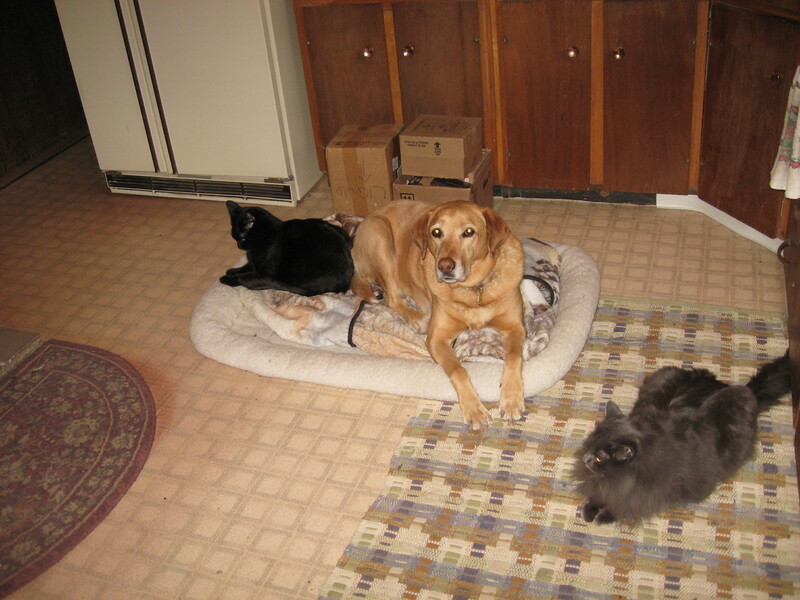 Shrek, Willow and Pal are keeping vigil next to the woodstove where it is warm and cozy and you don’t notice the wind blowing quite so much. Open Farm Days begin in 1 month from today! Oh my, there feels like so much to accomplish between now and then, and that is because there is so much to accomplish. 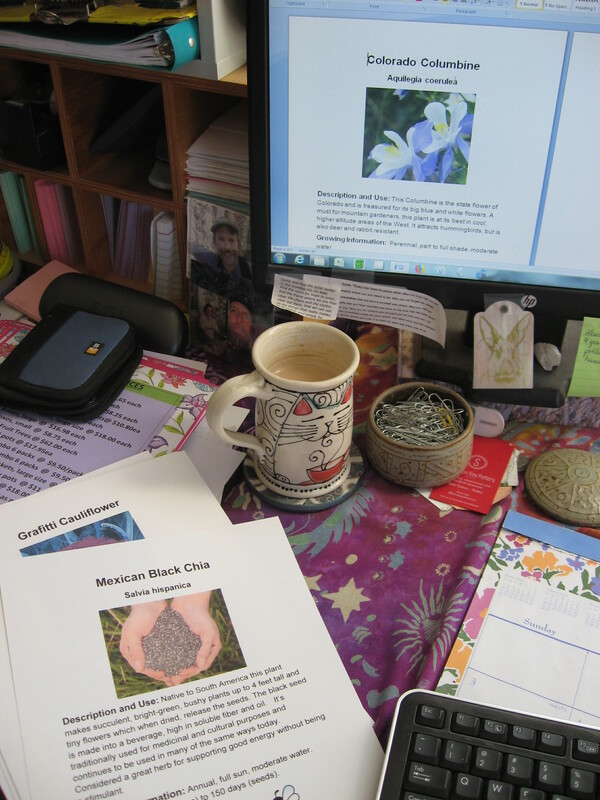 This weekend I’ll be hunkered down at the computer for a great deal of time working on plant signs for all the new plants we will have for sale in our Farm Stand Store during Open Farm Days. That is kind of a fun project when I can do it with a cup of chai and not too much stress. I think it will involve a lot of good music too. 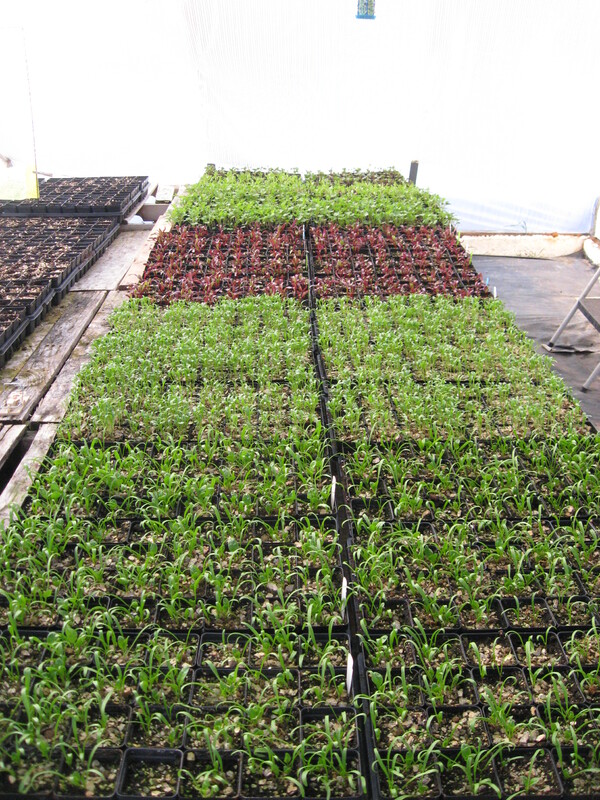 This week has been all about planting seeds, in the greenhouses and outdoors, and transplanting loads of baby plants! Susan, Kaila (above planting Echinacea) and Lizz had a massive seeding list to accomplish this week that included cool season veggies, eggplants and herbs. Look at the huge roots on that little potentilla fissa plant! 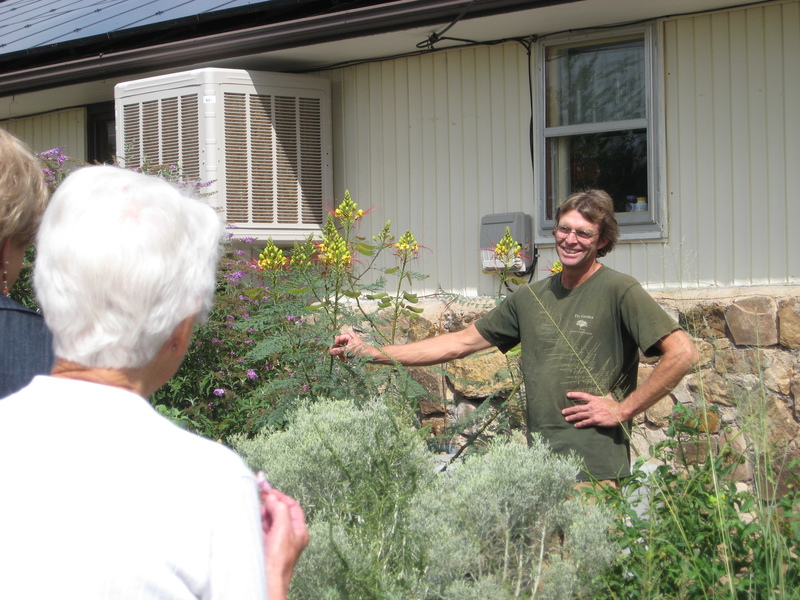 The women transplanted the first tomato crop, a crop of mints, fennels and dill, and more perennials than you can probably even begin to imagine! 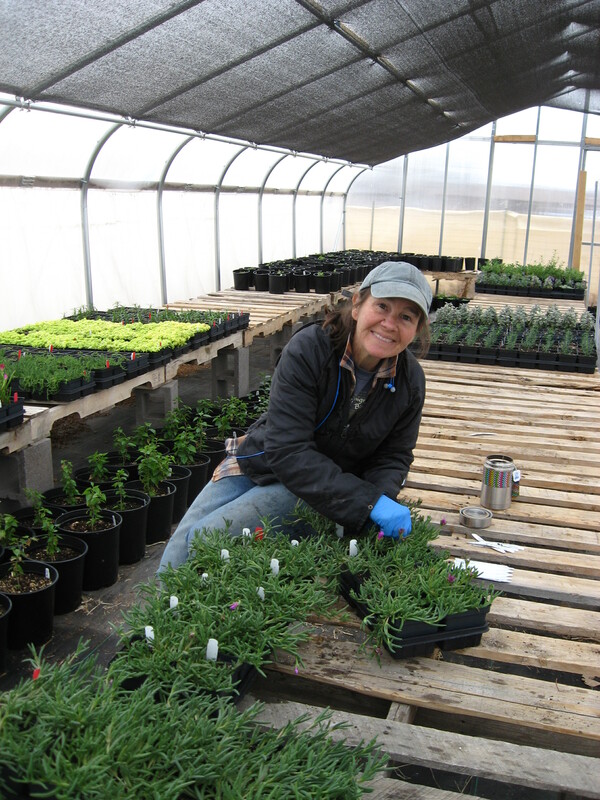 Chris and I are so fortunate to have such a great crew of women working with us in the greenhouses this spring. They are wonderful and efficient…we are in deep gratitude!! 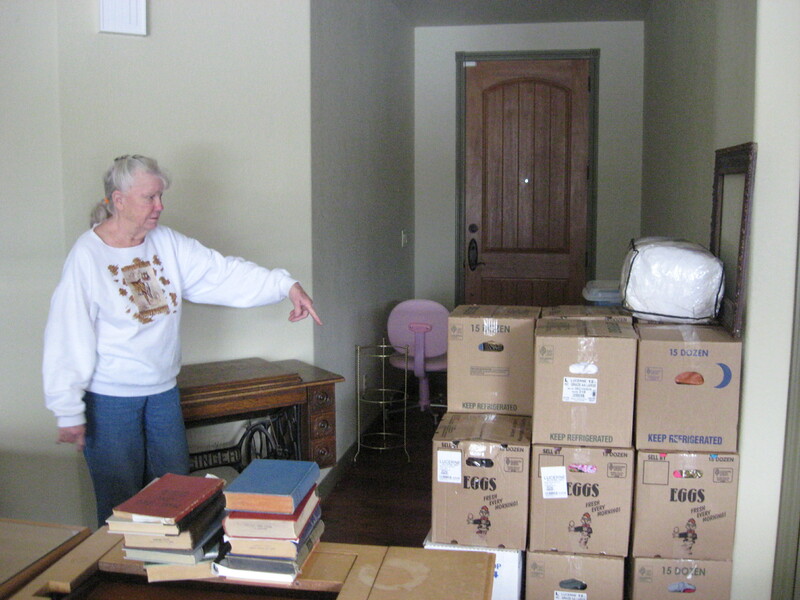 Part of the past couple of weeks has been spent helping my parents move to their new home. 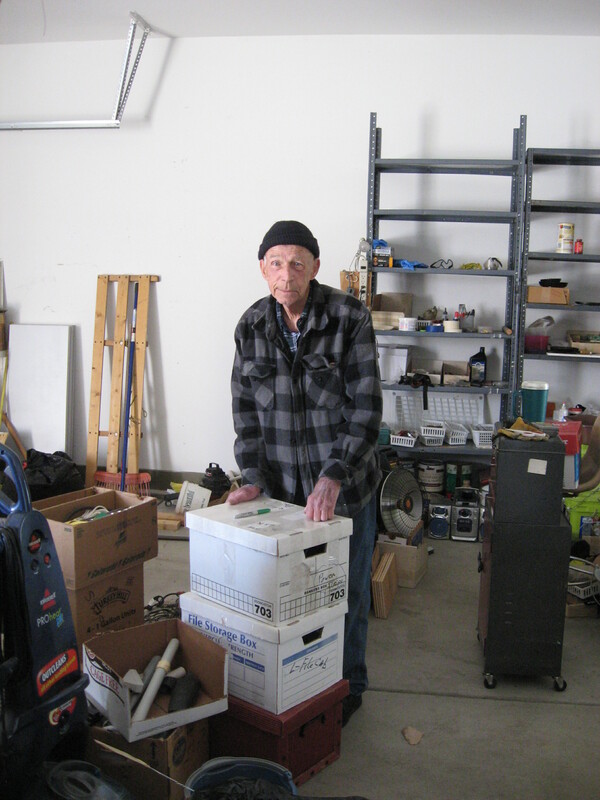 This past weekend, I helped my Dad pack up some of his workshop and move it, while my Mom was packing up closets inside the house. Nearly everything is moved to the new house now. Tomorrow I will help them move their houseplants before the snowy cold weather returns on Saturday night. Last week we had a lot of snow here. 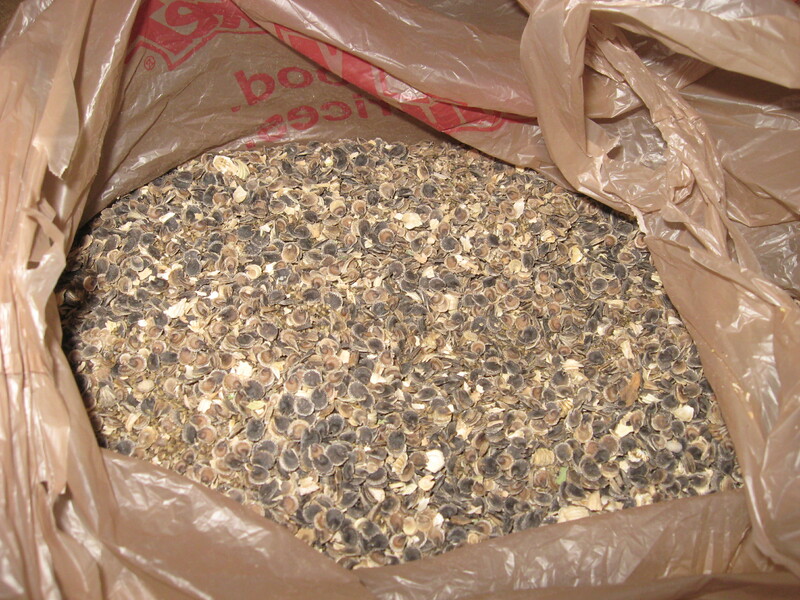 I had a huge bag of old hollyhock seed that is old enough now that it isn’t germinating reliably for production purposes, so I mixed all the colors together and while there was still snow on the ground, I scattered the seed along the parameters of our farm. It will come up sporadically and probably not too well, but whatever germinates and survives on its own without any extra attention from me, will add color to the edges of the farm and best of all, it will provide great pollinator flowers for all sorts of pollinating critters. 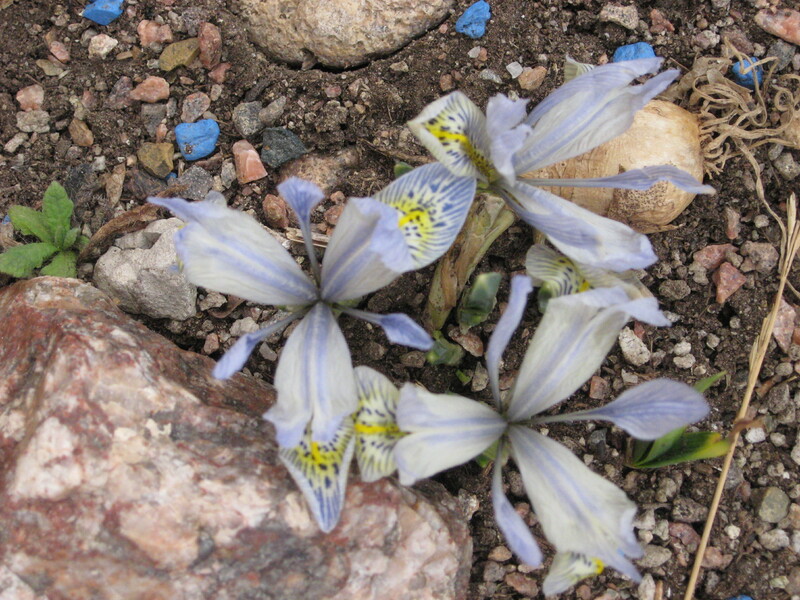 As last week’s snow melted into the earth, the snow carried the seeds to settle onto the soil. There is enough moisture right now in the soil for them to germinate when the soil temps get warm enough. So, we’ll see what happens later this spring. All manner of bees, both honeybees and solitary native bees, bumblebees and hummingbirds for sure…Probably some beetles, maybe butterflies, although I’m not sure if hollyhocks are good butterfly attracting flowers, and certainly a lot of beneficial predator insects too (which will hunt and eat pest insects) should all enjoy these flowers very much. Every now and then when I have old seed that isn’t really reliable for greenhouse production, I scatter it somewhere on the farm, either around the ponds if it is an appropriate perennial for that kind of habitat, or in the gardens, sometimes in the wildlife hedgerows. It is a nice way to still be able to use the seed, instead of just discarding it. Since I’m open-minded to whatever happens in terms of how much or how little germinates and survives, it is a win win for all concerned. The criteria to this is that it must survive pretty much unaided by anyone, as these are areas of the farm that only get watered when nature provides the moisture. The deer and other critters regularly move through these areas, so the seedlings might get eaten or trampled too much to survive. 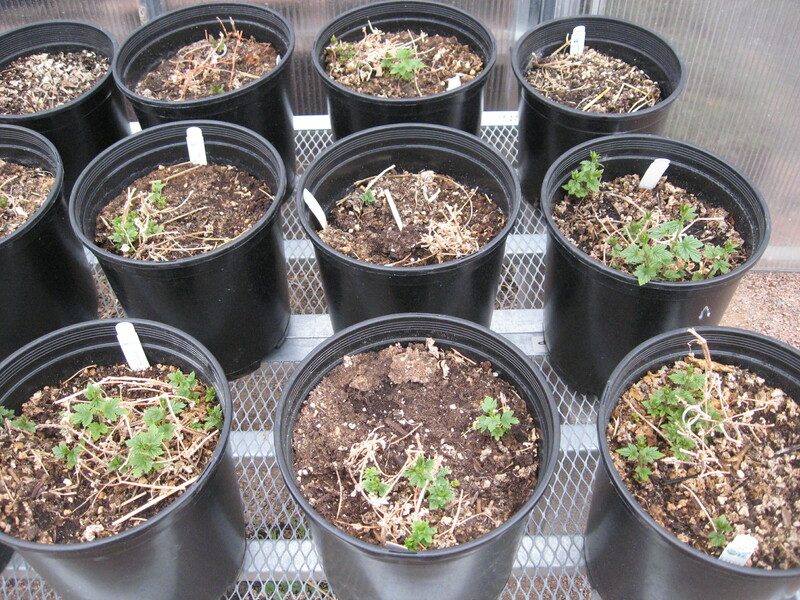 If it is too hot or too cold, or too dry, they may not make it. That said, many of the seeds that I scatter are really tough and known survivors. Hollyhocks are like that. Oh, and did I say that there is some old parsley seed in the mix? There is. This is a great food for cottontail rabbits, and the deer like it too, plus since it is in the Umbelliferae family, it is a great pollinator plant for butterflies, wasps of many kinds and flies of lots of kinds too including hover flies…all these insects are wonderful pollinators! The deer and rabbits can eat the parsley down and it will just grow back. Since it will come up on the edges of the farm, it will help keep those critters from eating other things in the gardens. I’ve been using this method for about 28 years now to redirect deer and rabbits from eating things I don’t want them to eat, but allowing them to eat the parsley, which they like, and can’t hurt. It is a peaceful method of wildlife management that has worked quite well for me. The parsley is a biennial, so in 2 years it will be done. It typically doesn’t re-seed very much, so it isn’t problematic. 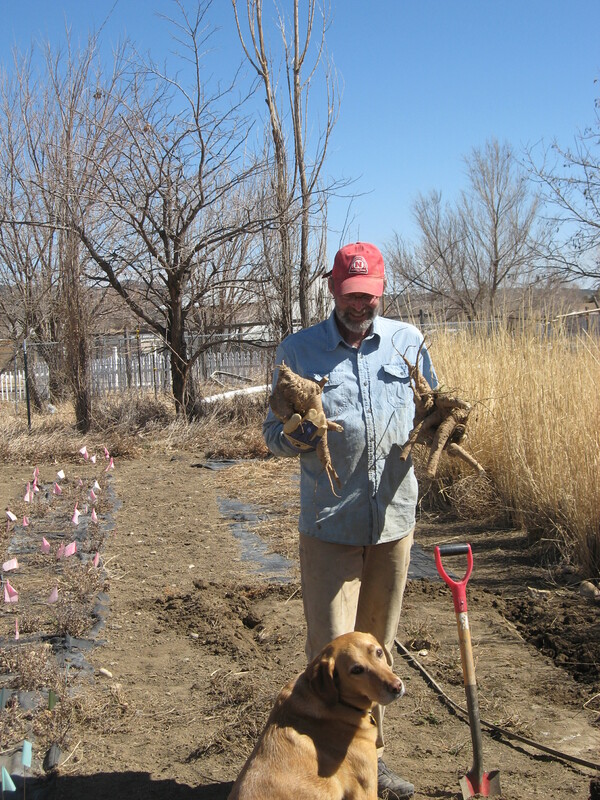 Next week we will be sowing a big tomato crop, and of course, transplanting these days is pretty much endless. 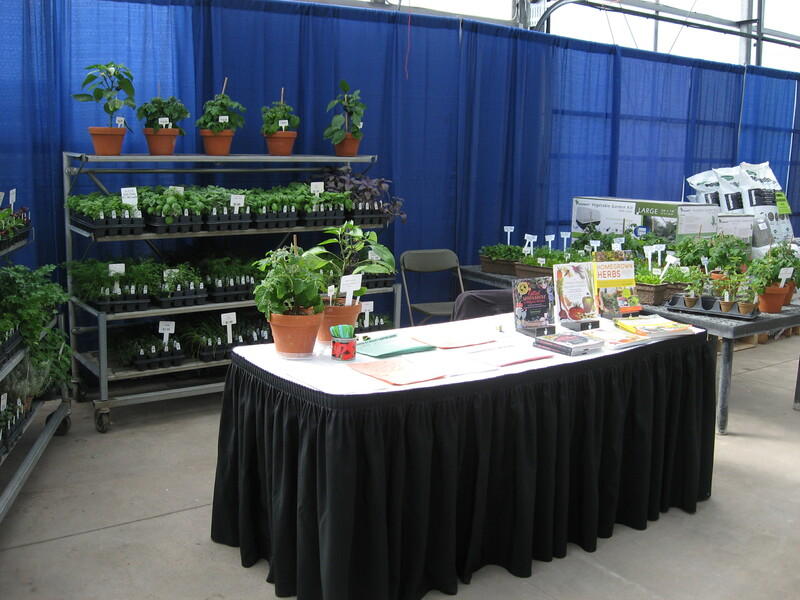 In addition, we will have a booth at the Spencer’s Home and Garden Show in Fountain, CO from Friday thru Sunday (March 8th-10th). Check out the details of that on the “Classes & Events” page of this website. On that Friday morning and Saturday morning, I’ll be teaching classes there and they will have lots of classes happening throughout the Garden Show event. All for now. Talk to you again soon! 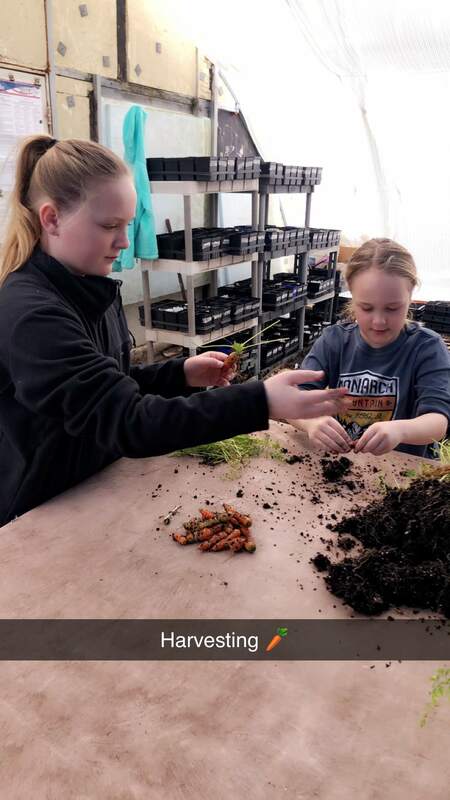 February 19, 2019 Cold, Friends Visit, Veggies & More! It has been so cold here this past week!! I must admit that I’m looking forward to warmer days. 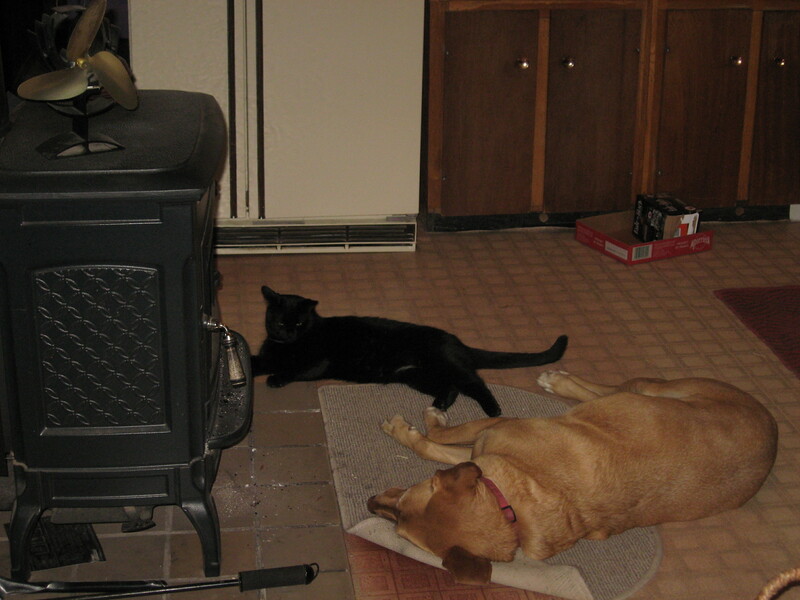 Willow and Shrek have been hunkered down in front of the woodstove and it takes some coaxing to get Shrek to even go outside right now. Hope you are all staying warm and cozy wherever you are! 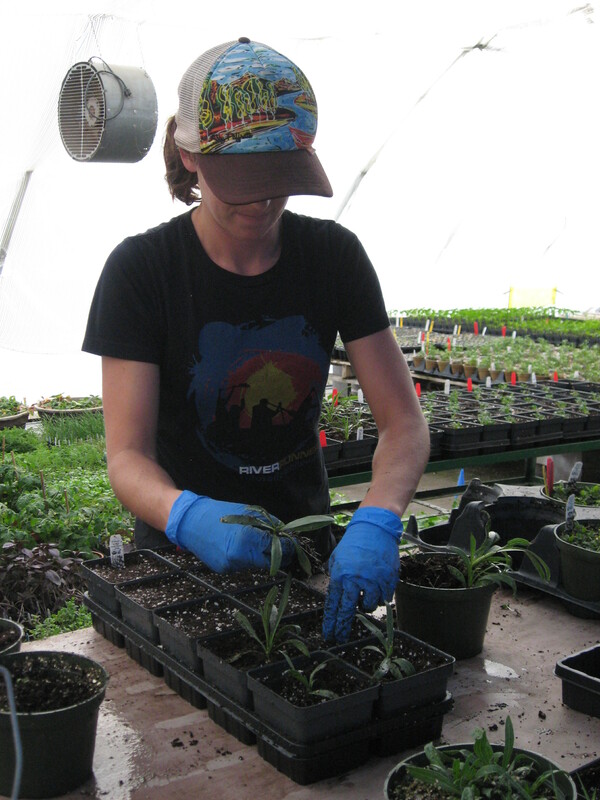 Two weeks ago the spring greenhouse crew came back to work. Susan (black shirt) is returning this year and Kaila (purple shirt) is a new crew member. We are so pleased to enjoy their company and have their wonderful help. There are more tasks to do these days than time to do them, so it is great having such a fantastic greenhouse crew to work with us. 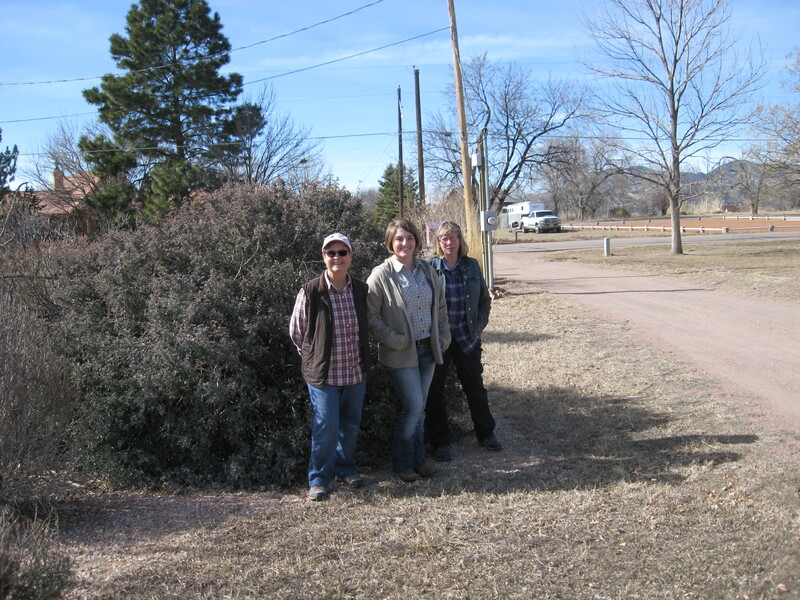 Our friends, who own Perennial Favorites Nursery in Rye, CO, came for a visit last week. These women are amazing plant people and it is always such fun to spend time with them. This visit, they brought their assistant, Brooke, with them and we enjoyed getting to know her. 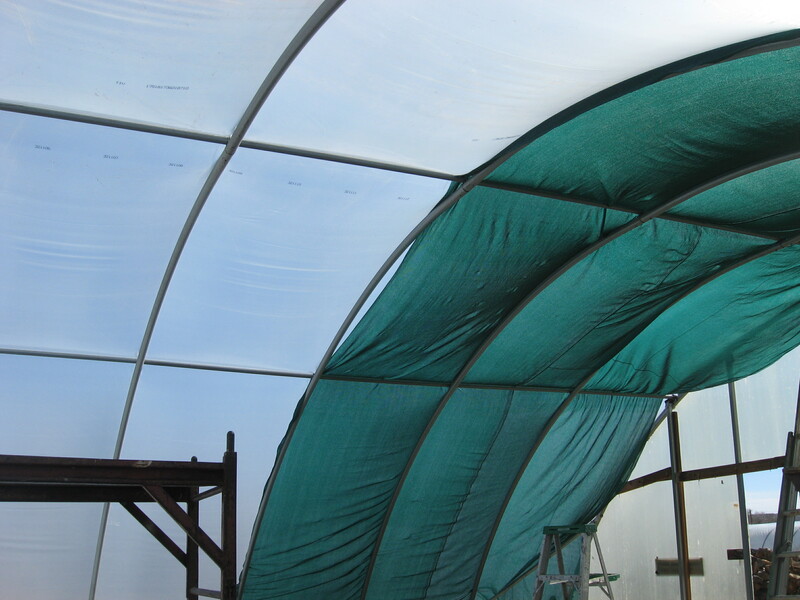 Our woodstove greenhouse needed a new greenhouse skin (plastic cover), so we took some time to get that done and install the green shade cloth inside. This house is currently housing our strawberry crop and cool season vegetables. We use a wood pellet stove to heat the woodstove greenhouse, hence its name, and the past few nights that little stove has worked very hard to keep the plants at 30 degrees with an outside temperature of 2 degrees. 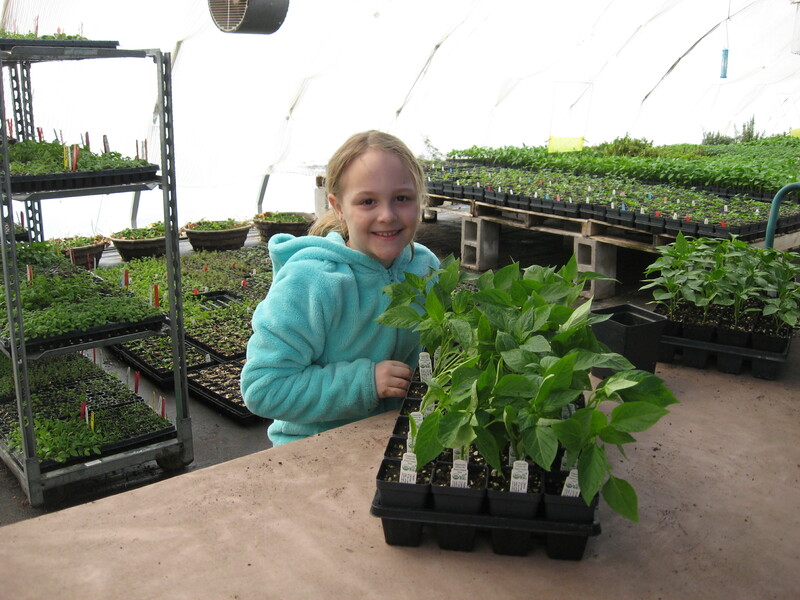 The first crop of peppers, for late March and early April sales, is being transplanted into 2.5″ pots. 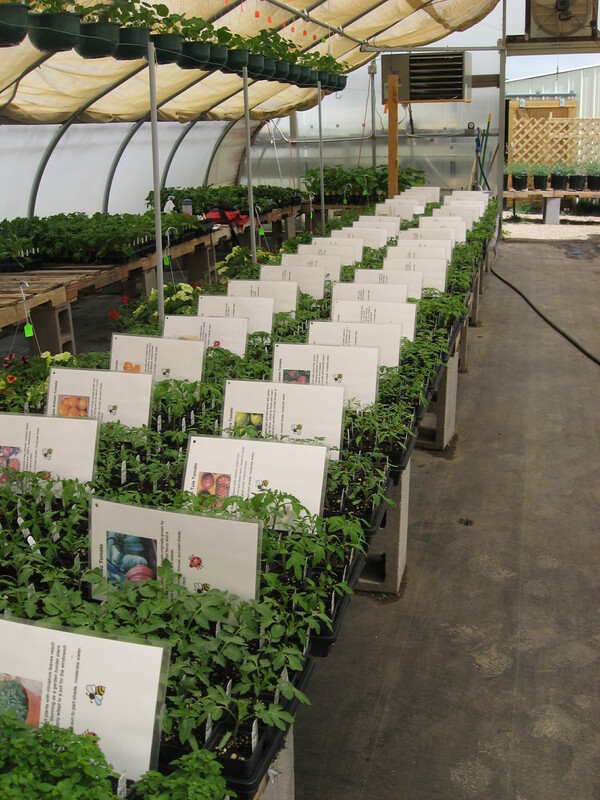 The main pepper crop that will be for sale starting in late April until they are sold out, was sown this past week. 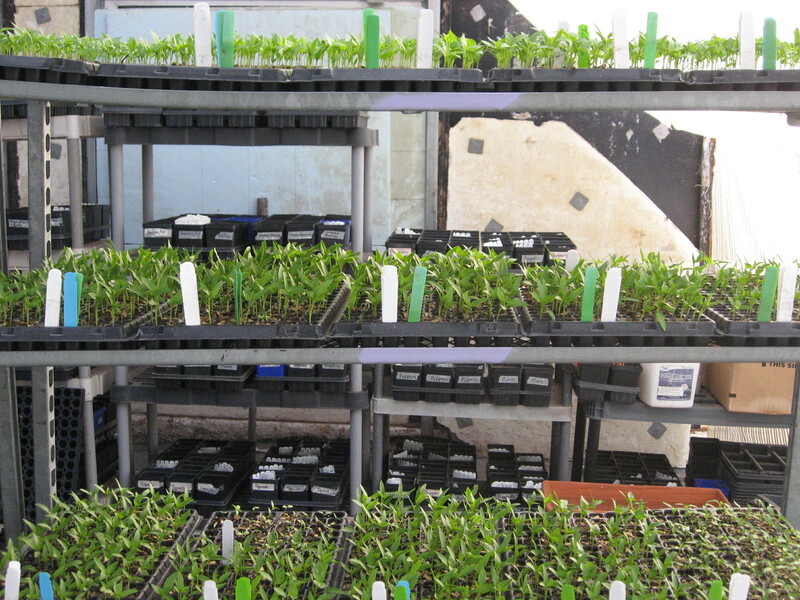 Remember the post I put up about 2 weeks ago showing the newly sown flats of cool season vegetable plants? Well, here they are growing nicely and the next crop of these kinds of veggies has been sown. 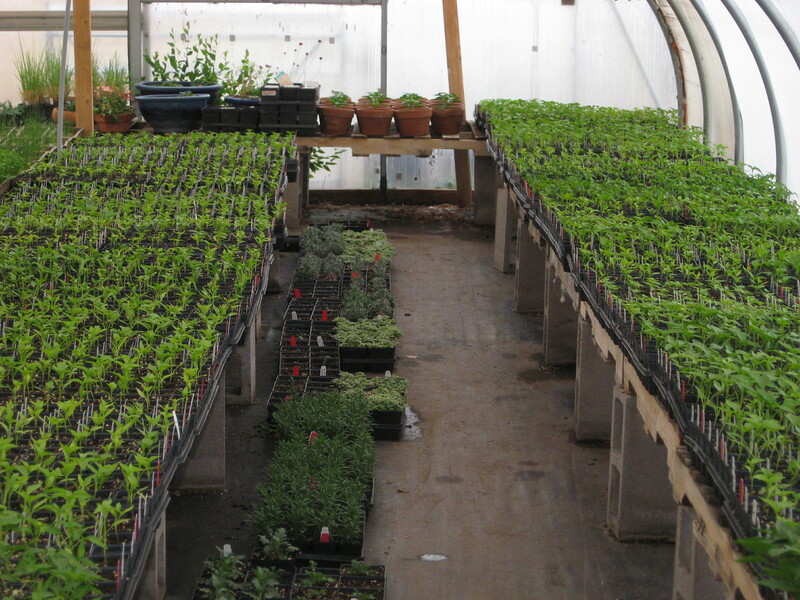 Our mother stock plants, that we use for propagating varieties of plants that cannot be grown from seed, usually lives in the nice warm Basil Greenhouse where we do all our propagation. 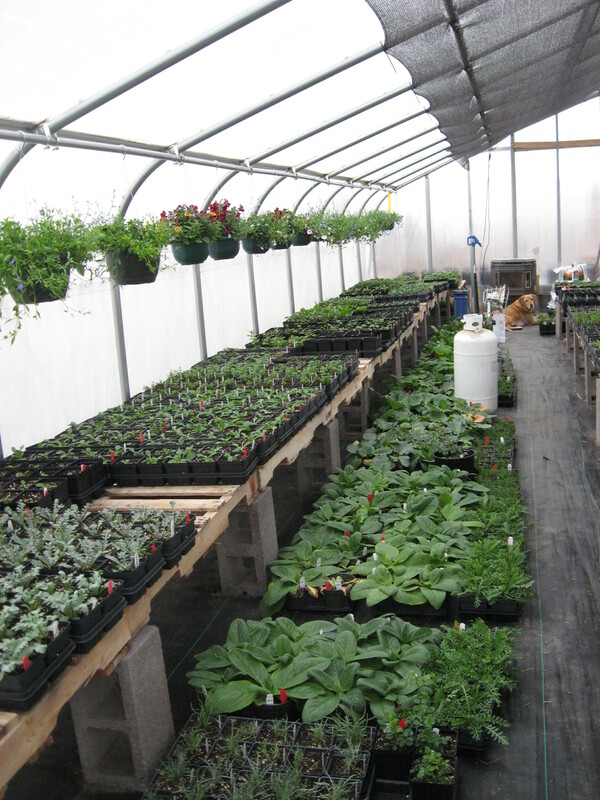 However, this time of the year their bench space is needed for warm season vegetable seeds like eggplants, peppers and tomatoes, so the mother plants get moved to one of our smaller greenhouse (called the Goldfish Greenhouse). They will live there until sometime in May when we have room for them to go back into the Basil House. It takes me most of a day to relocate all of them. They all live in large clay pots, so I enlist the wagon to move them down the aisle – much better than carrying lots of heavy clay pot plants! 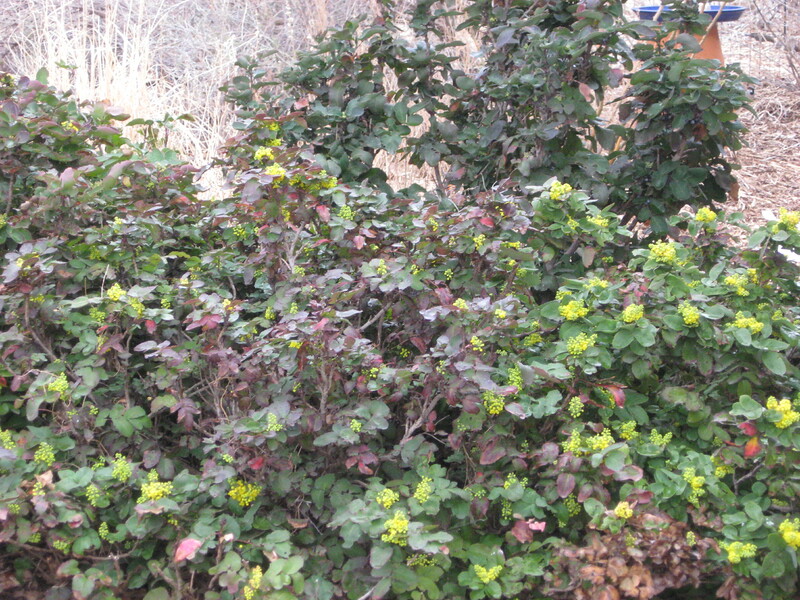 Our berry bushes are beginning to wake up from their winter’s sleep. These have been dormant all winter and now they are getting cleaned up, last year’s growth trimmed off and given a fertilizer meal. By spring they should be big and beautiful. 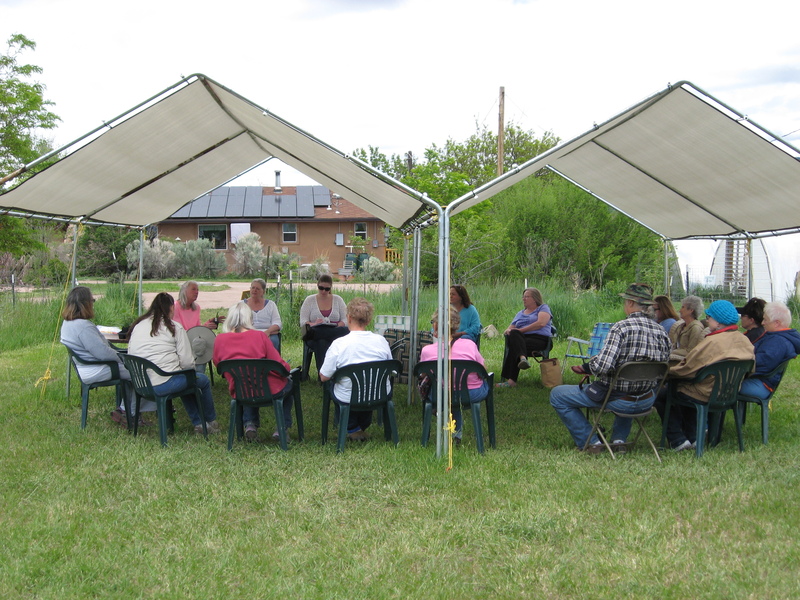 As a reminder, I have posted up the schedule on the “Open Farm Days” page, along with the classes and workshops schedule on the “Classes & Events” page of this website. Check it out to see when we open to the public this spring in mid-April. There are so many interesting and wonderful classes happening too. Hope we’ll see you then.